One Love, the UKs premier reggae festival, is bringing together one of the largest collections of soundsystems to ever grace the English countryside. The hop fields of Paddock Wood in Kent, for so many years a site for seasonal pickers balanced on stilts, will this summer be filled with towering piles of speaker boxes. One Love will be taking place on the weekend of August 10th-12th at Paddock Wood’s Hop Farm. For more details and tickets mosey on over to their website. via Soundsystem culture take over at One Love Festival | SupaJam / News. One love: Traditional sound systems ‘stringing up’ in the English countryside – Features – Music – The Independent. Marketers tell us we want to consume our music through dinky devices that fit in our pockets. But there’s still something magical about the vast apparatus of the sound system and the thunderous noise it generates. The traditional sound has an army of staff. There’s the “controller” to ensure everything functions smoothly, the “operator” on the turntables, the “selector” to pick out the tunes, one or more “MCs” to add vocal accompaniment and a crowd of “box boys” to hump the hefty wood-encased speakers into place. In times of high unemployment in the 1970s and 1980s, the sound system was a viable career option in marginalised Caribbean communities. Entire rooms in residential homes were often given over to the storage of the speaker boxes and equipment that provided the income for several families. These days, when a DJ will work solo from a laptop, the great sounds are rarely seen, which makes the One Love Festival such a great opportunity – and one all the more poignant for coinciding with the celebrations of the 50th anniversary of Jamaican independence next month . Veteran figures such as Lloyd Coxsone, whose Battersea-based system ruled the London dancehalls in the mid-late 1970s, have kept the tradition alive. Last month Coxsone sound played in a rare “soundclash” in the Coronet theatre in London’s Elephant & Castle, “testing” rivals Jah Tubbys and the long-standing Nottingham sound V Rocket by playing sequences of specially-commissioned dub plate recordings, many of them more than 30 years old. Coxsone arrived in England from Jamaica in 1962 and first performed as Lloyd the Matador, until water in an amp caused his system to implode. He started “Sir Coxsone” sound (named after the founder of Studio One records and Jamaican music pioneer Clement “Coxsone” Dodd) in 1969 and with his team – including star selector Blacker Dread – has amassed an almost unbeatable record box. He says much has changed in a modern era, where insurance cover is needed to set up an old-style sound system in a nightclub and separate premises are needed to house large collections of speaker boxes. “It’s not easy and you’ve got to love it – or you ain’t going to bother,” he says. Unlike the modern DJs who might flit from one club to another during a Saturday night, a sound system will take many hours to set up. The speaker boxes – in ascending order, the low and high bass bins, mid-range and “tops” – are delivered in large trucks and must be wired and positioned just so, in order to broadcast evenly to a wide area. Can’t make this year event due to lack of funds? Want to gain experience in the event industry? We currently looking for extra Volunteer Stewards and Build Crew. Urban Vault has hooked up with the ‘One Love Festival’ for a second year running, to give x3 readers/fans of the festival a chance to win a pair of VIP tickets to the weekend event in Kent this August. The One Love Festival takes place every year in August and is the UK’s Number 1 Reggae Camping Festival and is 5yrs old starting in 2008 in East Sussex and now have moved into new site Hop Farm in Kent. How are you going to celebrate Jamaicas 50th Anniversary of Independence? This years Thousands will be heading to Kent to the UKs No1 Reggae Dub camping Festival – One Love Festival. One Love are very excited to announce EUROPES LARGEST EVER REGGAE FILM PROGRAM 22 FILMS 8 UK PREMIERS + Screening and Question and Answer session of The RFF UNESCO Honour Award musical documentary Bob Marley: The Making of a Legend at One Love Festival followed by a very special Question and Answer session with Esther Anderson, Caribbeans First Lady of Film and Music. ABA SHANTI SOUNDSYSTEM, ADAM PRESCOT, ALPHA AND OMEGA, ALPHA STEPPA, BABY BOOM, BLOCO FOGO, BUSTER SHUFFLE , BOMB STRIKES SOUNDSYSTEM feat MOQUEE & PIMPSOUL, BY THE RIVERS, CONNIE & DI MAM DEM, CRONIC, CHANNEL ONE SOUNDSYSTEM, CHRIS COCO, CONSCIOUS SOUNDS FEATURING KING GENERAL, CORNELL CAMPBELL, COXSONE SOUND SYSTEM MEETS SAXON SOUND SYSTEN, DAWN PENN, DENNIS ALCAPONE, DIALECT AND KOSINE, DISCIPLES, DON CAMPBELL, DON LETTS, DUB PISTOLS SOUNDSYSTEM, DJ G AND FUTUREMAN, DUB SYNDICATE, DRUM MONKEYS, EARL GATESHEAD, ECCLETON JARRET, EDDIE K , ELLJAH MC, FENOMENOSHOW, FONTI AND BUSH (Formally Heartless Crew), FOWOKAN, FRANKIE PAUL, FREESTYLERS , FREDDIE MCGREGOR, FUNKY FLIRT, GAUDI, HATCHA, INSTRUMENT OF JAH SOUND SYSTEM, INTENSIFIED, IRATION STEPPAS, JACK CURTIS AND RED EYE BAND , JAH TUBBY SOUND SYSTEM ft ERROLL BELLOT, DIXIE PEACH, GREGORY FABULOUS et le. JAH WARRIORS, JUMPING JACK FROST, KEVIN ISSACS. KILLSONIC aka chasing Shadows, KING TUBBY’S HI FI, KOTCH AND KASKET, KRAFTY KUTS, MACKA B, MICHIGAN AND SMILEY, MINIMAN & EARL 16, NICK MANASSEH, NICKY BLACKMARKET, MIXMASTER MORRIS, MONKEY MAFIA, MR INNOVATION, OVER PROOF SOUND SYSTEM, RADIO RIDDLER, RAGGA TWINS, RAS KWAME, RHYMITIES, ROBBO RANX, SAXON SOUND SYSTEM marquee full sound system full crew, MC SIR REAL , MUNGOS HI FI , PHOENIX CITY All-STARS, SOUL CIRCUIT, REBELATION , SKORCHA AND PABLO, SIP A CUP ft MATTIC HORNS, SMITH & MIGHTY, SOOTHSAYERS, STYLO G, TAPPER ZUKIE, THE DUALERS, THE SKINTS, TONY TUFF, TROY ELLIS, TWILIGHT CIRCUS DUB SOUND SYSTEM, UNCLE DUGS, UNIVERSITY OF DUB, URBAN KNIGHTS, UNITY HI-FI, YOUTHMAN PROMOTION SOUND, VIBRATION LAB. via Win A Pair of VIP tickets to the *One Love Festival 2012* – The UKs NO1 Reggae/Dub Festival (August 10-12th) | Urban Vault. Bob Marley fans will get a rare opportunity to talk to one of his close friends at The One Love festival in Kent. It’s also screening a film telling the story behind Reggae legend Bob Marley’s life. The film presents the ‘lost footage of Bob Marley’ shot by Esther Anderson in 1973 and shows his first ever rehearsal with the Wailers.. After the screening festival goers will be able to ask Esther questions. via Festival honours Bob Marley – ITV News. How are you going to celebrate Jamaica’s 50th Anniversary of Independence? This years Thousands will be heading to Kent to the UK’s No1 Reggae Dub camping Festival – One Love Festival. The RFF UNESCO Honour Award musical documentary Bob Marley: The Making of a Legend at One Love Festival followed by a very special Question and Answer session with Esther Anderson, Caribbean’s First Lady of Film and Music. Giving One Love Festival audience a very special glimpse into Bob Marley before he was famous, and a rare opportunity to ask questions about Bob Marley to someone who personally knew him. The film presents the ‘lost footage of Bob Marley’ shot by Esther Anderson in 56 Hope Road in 1973, showing for the first time the young Bob Marley and the Wailers reasoning and performing their first ever rehearsal. This historical footage and Esther’s intimate narration reveals the love story between Esther and Bob, the writing of anthems like Get up stand up, I Shot the Sheriff and War. The restored footage also reveals the brotherly friendship between Bob Marley and Peter Tosh and the strength of the Reggae sound by the other legends Aston Familyman Barrett and his brother Carlton Barrett, unravelling a vision that gave birth of the union between Reggae music and Rasta consciousness during a time of social confrontation. In music Esther Anderson helped to develop the career of Millie Small, and Bob Marley and The Wailers. Her photographs launch ed the career of Bob Marley and The Wailers (All photographs appearing on Catch a Fire album and Burnin’ album were shot by Esther Anderson in 1973 to launch their international career). Esther was a minority shareholder of Island Records and an associate producer of The Harder They Come, casting Jimmy Cliff for the part of Ivan O Martin and coaching him for the part. A co-founder of Island Records, Esther helped to create a musical revolution from the early 60, giving an international platform to Jamaican musicians. Esther is a NAACP Image Award winning actress in Hollywood films opposite actors like Sidney Poitier and Sammy Davis Jr. Among her credits she play the lead role opposite Sidney Poitier in A Warm December – for which she was put forward for an Oscar nomination by the Academy of Motion Picture Arts and Sciences. She was made an Honorary Citizen of Memphis Tennessee for her contribution to music and films. via EUROPE’S LARGEST EVER REGGAE FILM PROGRAM 22 FILMS 8 UK PREMIERS + CHARITY ANNOUNCEMENT | Festivals for All. One Love Festival 2012 Preview: Intimate And Friendly. The word spreading from the mouths of all festival goers this summer is ‘One Love’. This intimate and friendly festival has wasted no time in becoming the UK’s No. 1 reggae and dub festival. Created as the UK’s 30th anniversary of Bob Marley’s famous concert and falling on the 50th Anniversary of Jamaica’s independence year, this one is sure to revitalise those powerful, soul enhancing vibes brought to our people by reggae music in the 70’s. Set in the magical vast countryside of Hop Farm, these 500 acres will welcome you with saunas, interactive art spaces healing areas and burlesque dancers. Indulge yourself in hand made treasures at the craft stalls or travel through one of the many fair trade villages. It is One Love’s organic growth that has built such a refreshing and beautiful returning fan base. This family friendly festival provides a fun, enlightening atmosphere for children to safely explore and enjoy. Aside from all it’s visually stunning beauties, One Love is more than the art forms you will see. It has an enriching historical story that stems from an attempt to link Jamaica’s feuding political parties by a performance by Bob Marley and The Wailers at the One Love Peace concert in Kingston’s National Arena. Allow yourself time to take a tour around the Reiki and massage huts and allow healing hands to calm your mind and uplift your spirit. Then let your re-energised mind drift away during a classic reggae film at the screening of the Largest Reggae Film Programme in Europe. You can also grab a local ale and choose foods from all over the world whilst you catch up with some of the stars behind these classic reggae films. With acts like Freddie McGregor, Frankie Paul and Dub Syndicate there’s no doubt One Love will be the word on your mouth this summer. Bringing reggae and the message of Bob Marley to the people – One Love, One Heart, a World Without Boarders. Don’t forget to check out some new fresh new talent too. By The Rivers and Ska’d for life are the one’s to keep an eye out for this festival. And as you trail off to bed you will be welcomed by glamping level camp sites and with toilets and showers already in place that unwanted portaloo scent won’t be making it back to your tents with you. All this for just £110 for the weekend or £45 for a day ticket. One Love. via One Love Festival 2012 Preview: intimate and friendly. | This Festival Feeling. Our Live in vehicle area this year has electrical hook ups, separate shower and toilet blocks – it is going to be a bit like a Irie Butlins weekender – but these are selling out fast so if you haven’t secured your Live In Vehicle spot do so before they all go to avoid disappointment!!! Here’s the 2012 Line-up as of 1st May 2012: (Click here to get the most up to date Line-up and to read bios on all of the artists) Tickets range from £20 for a child’s day-ticket, up to £100 for an adult’s full weekend ticket. Full ticket information here. via One Love Festival, Kent – Trojan. The festival has also booked some acts from the world of Jungle- that most English form of reggae- with a host of DJs putting in an appearence. Spearheading the junglists are turntable legends Jumping Jack Frost, Nicky Blackmarket and Funky Flirt. After the sandwich, jungle is basically the best thing England ever invented. Here’s a Jack Frost classic to prove my point. via Junglists and Fun Lovin Crims added to One Love bill | SupaJam / News. Tickets go up in Price on Tuesday 1st May – this is last couple of days in 2012 you be able to grab a bargain Early Bird Tickets to what is looking to be The Must Attend Festival of the year!! BOOM!!! Radio Riddler aka Fun Lovin Criminals’ members Fast, and Frank Benbini will be showcasing their ‘Purple Reggae’, a reggae tribute to Prince and the ‘Purple Rain’ album in its entirety at this summer’s One Love Festival. One Love Festival goers will get to hear the album in full at this year’s event. Also confirmed today are Jumping Jack Frost, Nicky Blackmarket, Funky Flirt, Uncle Dugs, Dialect, Kosine, and Mr Innovation. Now in its fifth year, One Love festival, happens from Friday 10th until Sunday 12th August 2012, at a new location, moving away from London to The Hop Farm, Paddock Wood, Tonbridge, in Kent. There are already some acts confirmed for the event which was created in recognition of one of the worlds greatest ever rock gig, Bob Marley’s famous 1978 ‘One Love’ concert, the One Love Festival is the UK’s only annual Reggae Camping Festival. One Love Festival is one of the largest gatherings of Top Sound Systems gathered any where in the Country including a Saxon Sound System meets Coxsone sound system all day collaboration – joining them are Aba shanti I, Iration Steppas, Youthman Promotional Sound, King Tubby Sound System, Chanel One Sound System, Jah Tubbys Sound System, Mungo’s Hi Fi, Twilight Circus Sound System, Unity Hi Fi, Instrument of Jah Sound System. Also confirmed are Chris Coco, Conscious Sounds, Disciples, DJ G and Future Man, Don Letts, Dub Pistols Sound System, Earl Gateshead, Eddie K, Fenonmeno Show, Fonti and Bushkin, Freestlyers, Gaudi, Hatcha, Killsonic, Krafty Kuts, Nick Manasseh, Ras Kwame, Robbo Ranx, Smith and Mighty, and Urban Knights. Over 4 stages, the Largest Reggae Film Program ever shown in Europe, Children’s and chill out area, food from around the world, with ‘Crazy Wigs’ as this year’s One Love Festival theme, attendees can join the walk about performances, fire eaters, percussion drum circles and burlesque dancers for a weekend in the sun shine. Extended Early Bird Tier 2 weekend adult (aged 16+) tickets are priced at £100 until May 1st when will go up in price too Tier 3 full price tickets. Children’s tickets (for those aged 5 to 15 years) are priced at £60. Children aged under 5 years can attend for free. Please note that all under 18 year olds must be accompanied to the festival by an adult. An adult cannot be responsible for more than 4 under 18 year olds each. Proof of age for child tickets may be required on site. Live in vehicle tickets are priced at £45 for weekend. via Purple Reggae for One Love Festival – Fun Lovin Criminals crew bring reggae version of Prince’s Purple Rain. One Love Festival has announced new acts today (26 April). 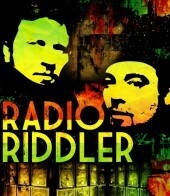 Radio Riddler, aka Fast and Frank Benbini from Fun Lovin’ Criminals, will be showcase their new album ‘Purple Reggae’, a reggae tribute to Prince’s ‘Purple Rain’ album, in its entirety at this year’s festival. Also confirmed today are Jumping Jack Frost, Nicky Blackmarket, Funky Flirt, Uncle Dugs, Dialect, Kosine and Mr Innovation. Freddie McGregor and Frankie Paul will headline this year, joining fellow Jamaicans Studio 1 falsetto singer Cornel Campbell, Dub Syndicate, Michigan and Smiley, Tapper Zukie and Kevin Issacs, son of the legendary Gregory Issacs, at the event, as it moves to The Hop Farm, Paddock Wood, Tonbridge, in Kent for its fifth year, on 10-12 August. The festival also promises “one of the largest gatherings of top sound systems gathered anywhere in the country” – including a Saxon Sound System meets Coxsone sound system all day collaboration in the UK for the first time, as well as Aba Shanti I, Iration Steppas, Youthman Promotional Sound, King Tubby Sound System, Chanel One Sound System, Jah Tubbys Sound System, Mungo’s Hi Fi, Twilight Circus Sound System, Unity Hi Fi and Instrument of Jah Sound System. Spreading out over 4 stages, the festival also boasts the largest Reggae Film programme ever shown in Europe, plus a children’s area and a chill out area. One Love Festival tickets are on sale now, with Early Bird Adult Weekend tickets priced at 100, with child tickets at £60. 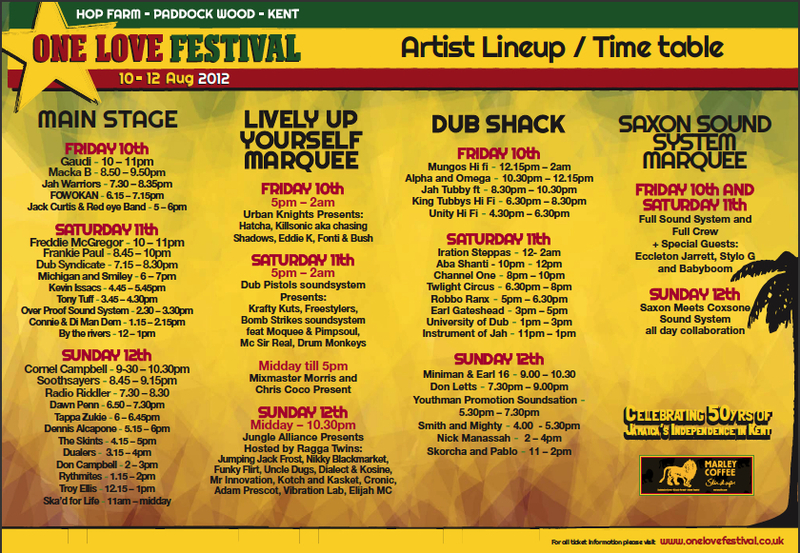 via New acts for One Love Festival 2012 – Get ready for some ‘Purple Reggae’… – Festival News. Very few Tier 2 Tickets remaining it will increasing to tier 3 soon – a BIG BIG BUZZ on this years event – get your ticket before they go up in price!! In the decades since 1972 when Jamaica’s first feature film “The Harder They Come” exposed reggae to the world on its soundtrack, a growing number of films have continued to be made that focus on Jamaica’s music culture. In 2008 these films were given the title “Reggae Films” and gathered together in one place for the first ever REGGAE FILM FESTIVAL, held in New Kingston February 25th-27th. via One Love Festival – Caribbean Culture – Zimbio. Hundreds of Reggae lovers are expected to head to the One Love Festival in Kent this August, to celebrate 50 years of Jamaican Independence. For the first time, the event, which has been running at other sites for 5 years, is going to be held at Hop Farm in Paddock Wood. Two years ago, Julian Marley, the son of Reggae legend Bob Marley played at the festival and this year it’s partially funded by a coffee company which is run by another of Bob Marley’s sons Rohan. The original One Love Peace Concert was a large concert held on April 22nd, 1978, at the National Stadium in Kingston, Jamaica. This concert was held during a political civil war in Jamaica between opposing parties – the Jamaican Labour Party and the People’s National Party. The concert came to its peak during Bob Marley & The Wailers’ performance of “Jammin”, when Marley joined the hands of the two political rivals and appealed for unity. via Kent festival to mark 50 years of Jamaican Independence | Meridian – ITV News. Only 200 Tier 2 Early Bird Tickets remain!! https://onelovefestival.co.uk/wp-content/uploads/logo.png 0 0 Dan https://onelovefestival.co.uk/wp-content/uploads/logo.png Dan2012-04-17 11:45:492012-04-17 11:45:49Only 200 Tier 2 Early Bird Tickets remain!! We are over the moon to announce that we have teamed up with Big Green Coach company, the music travel company, who will be providing direct coach services from London Victoria and Brighton to One Love festival, so why not leave your car at home, sit back, relax, and let Big Green Coach take you to the heart of the Festival. Coach travel is the most environmentally friendly way of getting to the festival and Big Green Coach makes it even greener with their commitment to plant two trees for every coach they bring to the festival! Save money and the environment as return coach travel is only £24. To make it even easier you can buy your festival tickets with your travel. Let the famous One Love atmosphere start the moment you get on board with Big Green Coach. Who? Freddie McGregor, Frankie Paul, Cornel Campbell, Dub Syndicate, Michigan and Smiley, Tapper Zukie, Kevin Issacs and many more. Why attend? Assuming the weather holds up, there can be no better sound of the summer than the sights and sounds of the Caribbean – and One Love aims to deliver just that. From top reggae stars to leading sound systems, the Hop Farm should provide a perfect back drop for a laid-back slice of summer fun. History: Created five years ago, the One Love Festival comes to Kent in what it hopes will be a regular new home at a venue which the Hop Farm Festival has propelled into the spotlight. The line-up is strong with a range of stages; this could prove to be the county’s surprise hit of the summer. How much? Limited early bird tickets for the weekend are still available for £100. After they run out its £110. Children 5-15 go free. via Music festivals in Kent 2012: Updated – Home – Your Tonbridge. via Top 100 music festivals: April – September 2012 – Telegraph.